Whether you’re a bride-to-be, a member of the bridal party or simply an invited guest, bridal parties can be loads of fun. 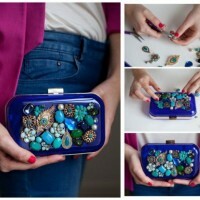 This is especially the case if it happens during the summertime when you can enjoy the warm weather and fresh air! So, if you’re someone who has the pleasure of planning a bridal party or you’re the bride and you’re looking for some tips on how to make it creative and memorable, here are 26 ideas that will be sure to be a real hit! 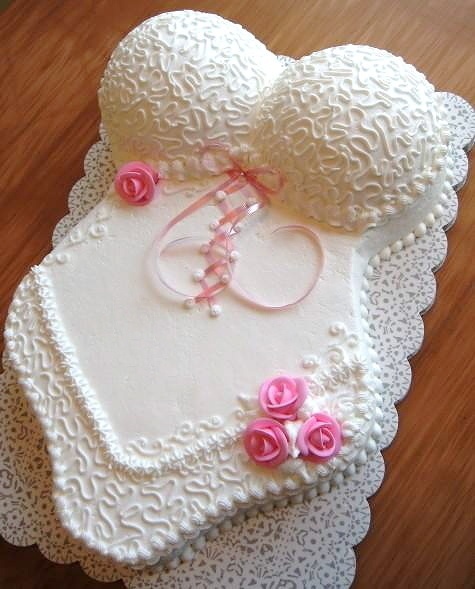 Would you prefer to go without a traditional cake? If so, how about cupcakes instead? Basically, they are single-serving size cakes. 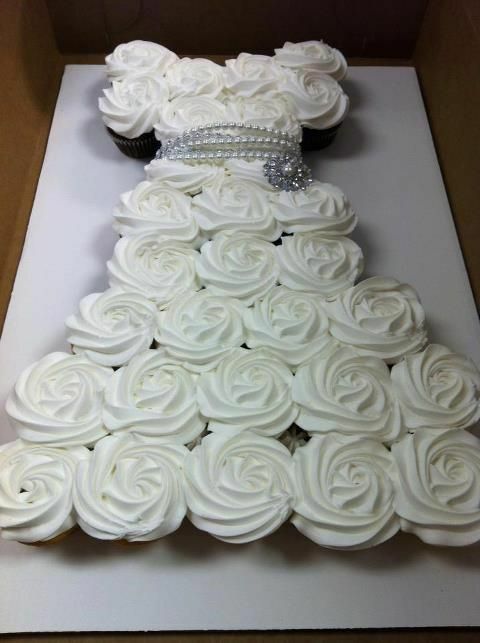 Plus, you can arrange them in innovative ways—like this wedding dress, for example. 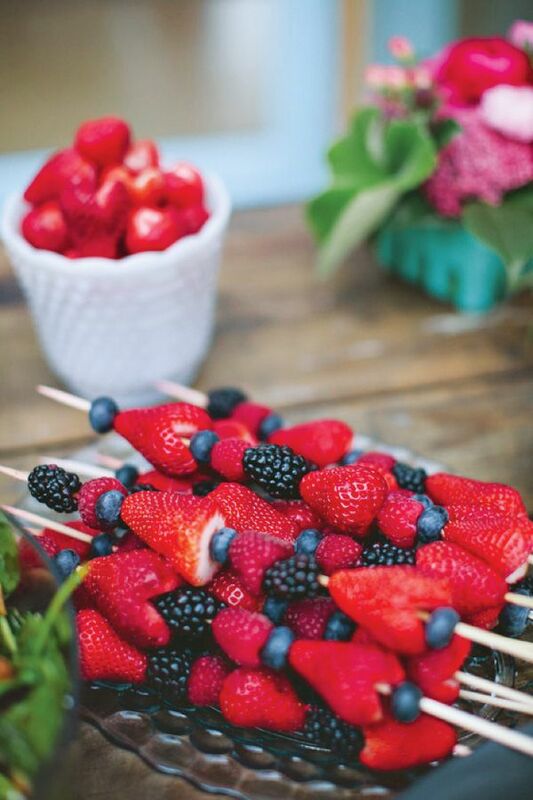 Nothing says “summer” quite like fresh fruit. And one of the best ways to serve it to a group of people is as kabobs. Strawberries, blackberries, raspberries and blueberries are so sweet, refreshing and pretty healthy too. Aren’t these cookies just too cute for words? 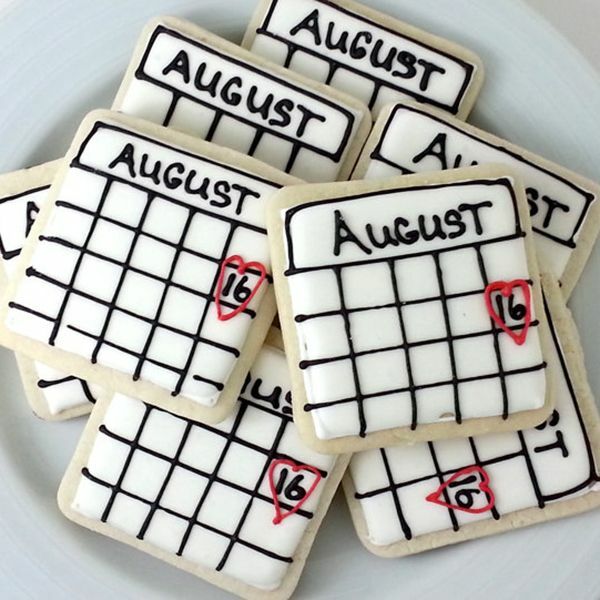 If you want your guests to remember your wedding date, this is a delicious way to do it. 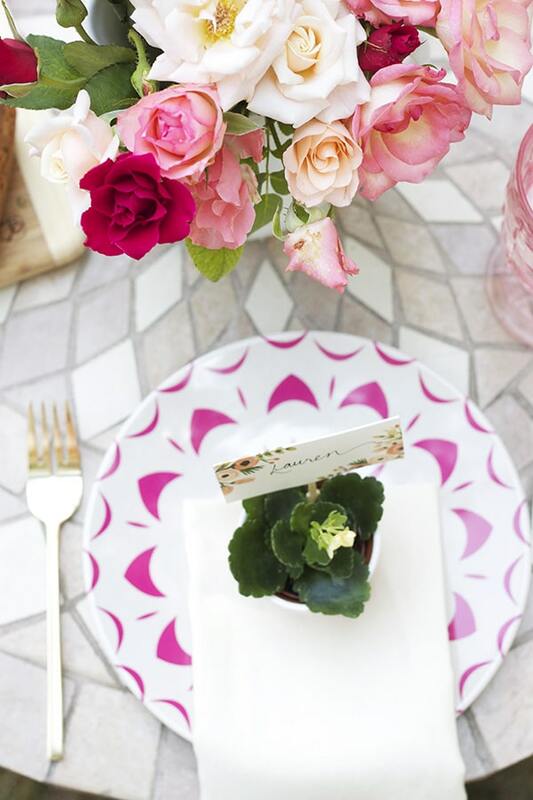 If you’re planning on having a sit down brunch, lunch or dinner, plant place holder are unique. Plus, they can also serve as eco-friendly party favors too. 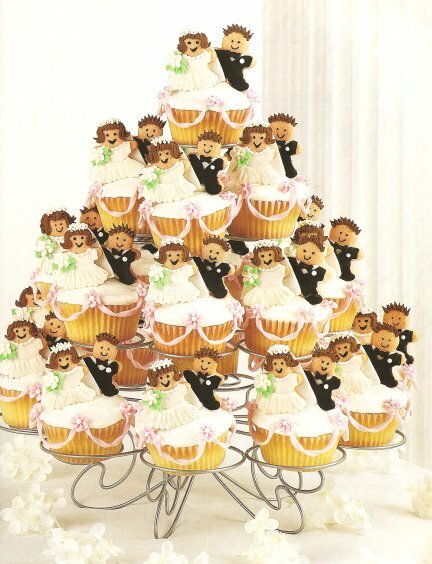 Here’s another cupcake display idea that will be sure to be a favorite among your guests. They can be actually miniature dolls or gingerbread brides and grooms. 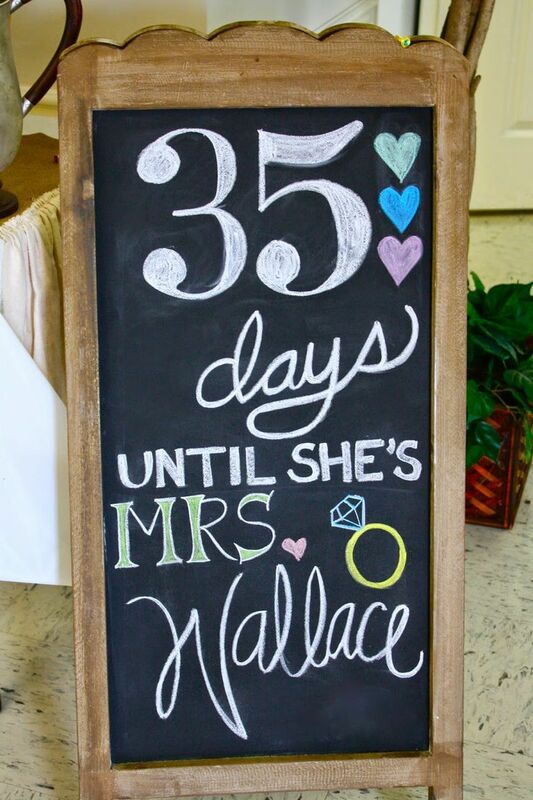 This chalkboard announcement is perfect in the entrance of your bridal shower venue (or area) or on your gift table. If there is a signature flower for weddings, it would probably be a rose. 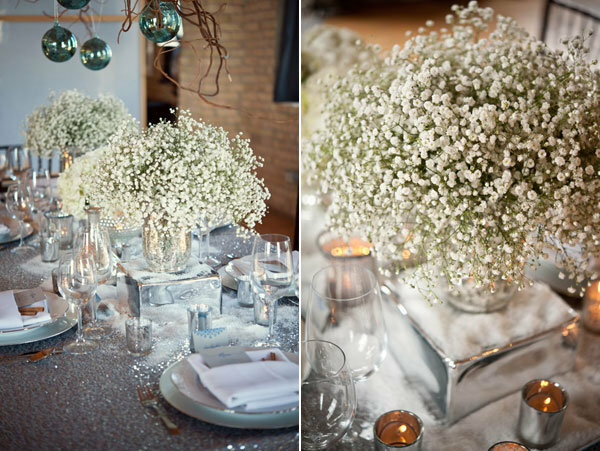 And if there is a signature addition to flower arrangements, it would probably be baby’s breath. As you can see, it’s gorgeous as a centerpiece. Plus, it’s quite affordable too. What woman doesn’t like pampering her feet ? 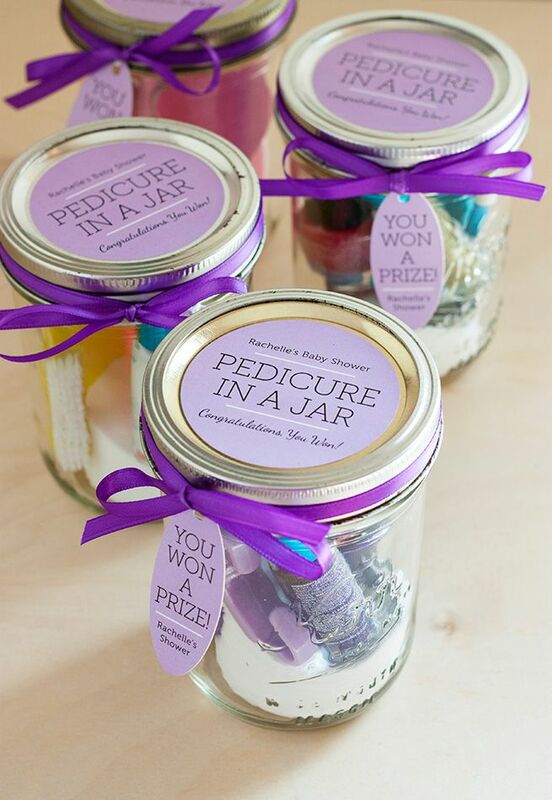 Well, by making these pedicure party favors, your guests will have something that they can take home and use—time and time again. 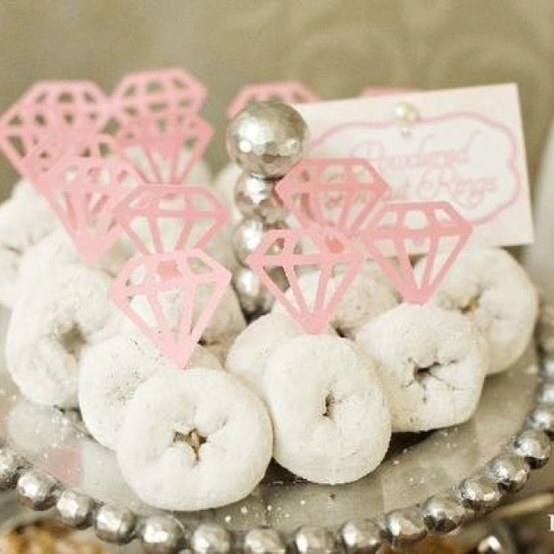 Brides have plenty to be thankful for and to toast to at their bridal shower. Trimming champagne glasses in gold sugar is a tasty treat. Yeah, this is a great idea too. Powdered donuts are really easy to find at your local grocery store. Then by cutting some diamond rings out of poster board, it will put everyone in mind of your engagement ring. 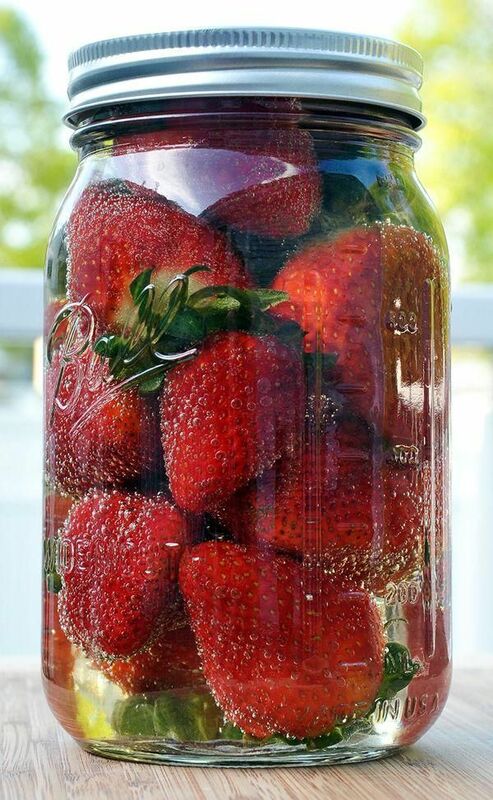 The only thing better than drinking champagne and then eating strawberries is eating strawberries that have already been soaked in it. Yum! 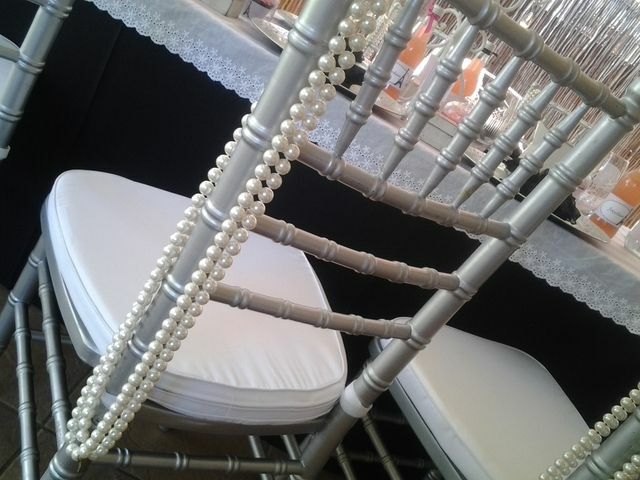 Pearls are precious gems that are feminine and dainty. 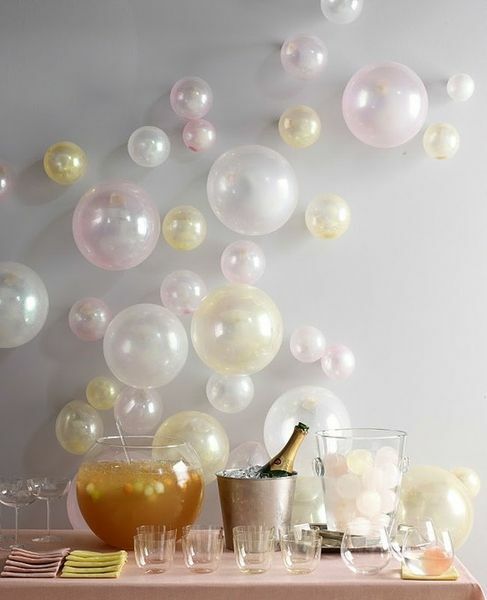 If you would like them to be a part of your bridal shower theme, All you need to do is tape some white, off-white and pink balloons to one of the walls. Just make sure they are different sizes to give a better effect. 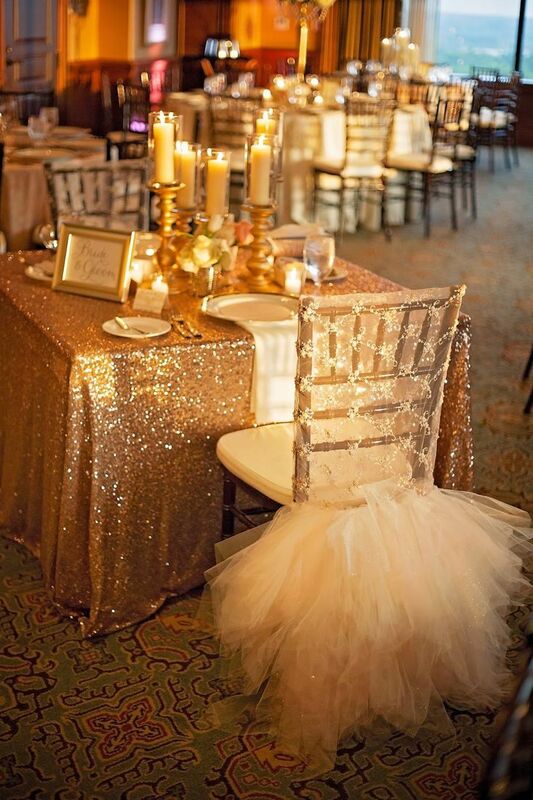 We really like these table settings. 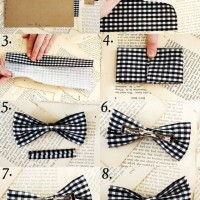 And look how easy they are to make! 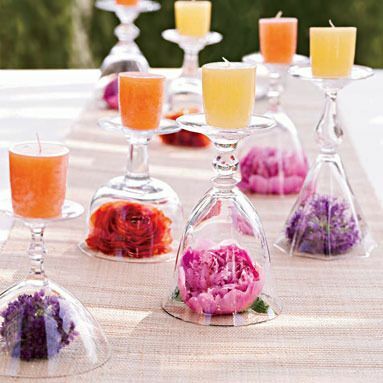 Just put a flower (like a peony) on the table and turn a glass upside down and put it on top. Then add a candle to the base of the glass and you’re done. 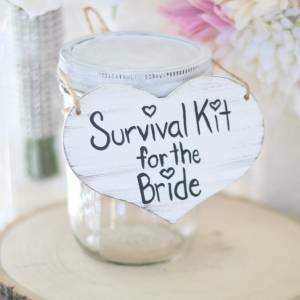 Every bride needs a survival kit. 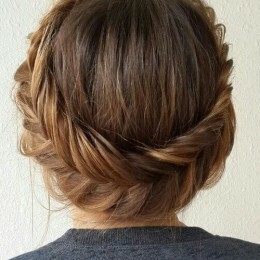 No, not for the marriage but for the wedding day. It can be filled up with things like safety pins, Krazy Glue and other items that guests may feel will prevent the day from any major mishaps. On a hot summer day, soft serve yogurt or even some ice cream will be a hit among all. 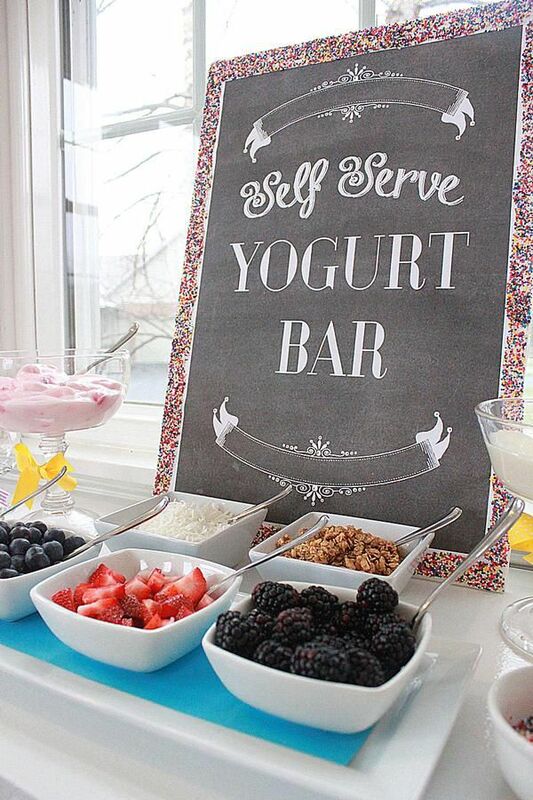 Yep, you can never go wrong with a yogurt (or ice cream) bar. 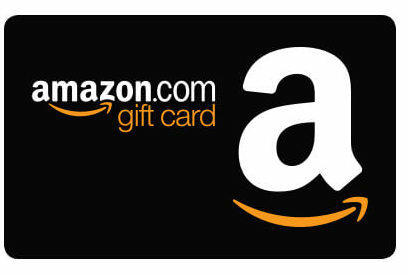 Showers and weddings are sure to lead to lots of gifts, but who wouldn’t like some cold hard cash as well? 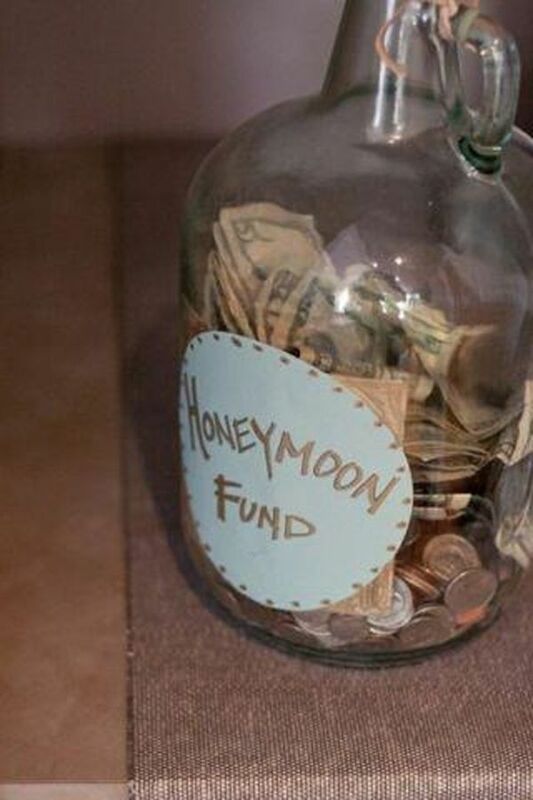 If you put out a jar with “honeymoon fund” put on it, folks will be sure to catch the hint. If you do want a cake, avoid the boring predictability of a plain ole sheet cake. Personally, we really like this white teddy one. It’s so…honeymoon inspiring. Here’s another brilliant centerpiece idea. 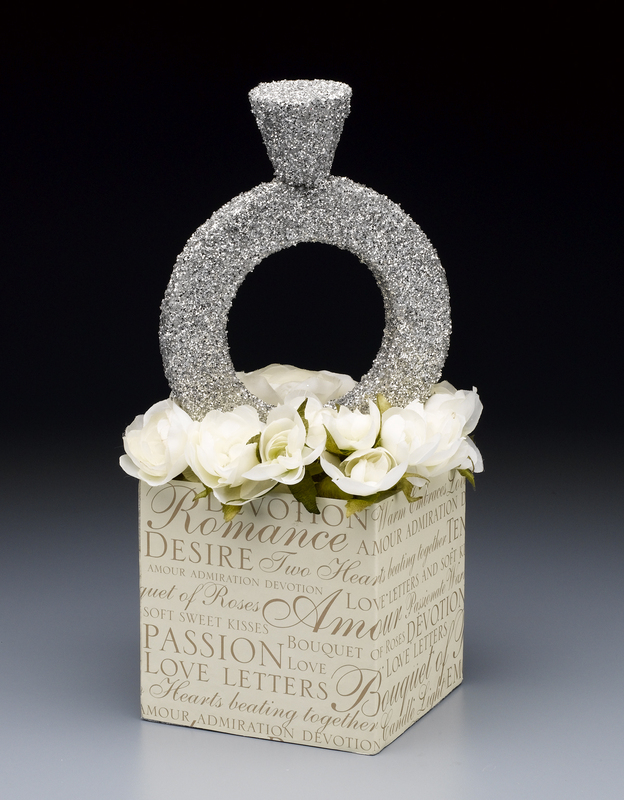 Get a box, add some (real or fake) flowers and then cut out some diamond rings in cardboard and dip them in glitter. Some of your guests will be sure to ask if they can bring some of them home. 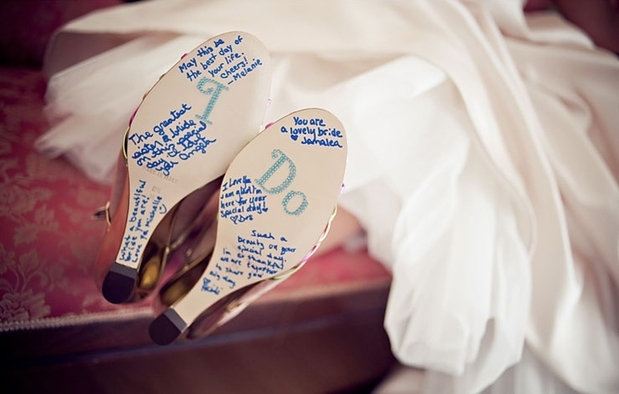 Some brides would like their guests to sign a guestbook. Others? They bottom of their bridal shoes. What a fun and creative way to commemorate the shower. 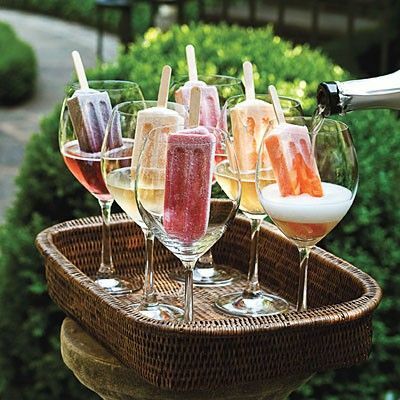 Two things that you probably never thought to combine before are popsicles and champagne. Trust us, you’ll be glad you took this delectable risk. You always want to be able to keep the romance alive. One way to do that is to plan date nights. 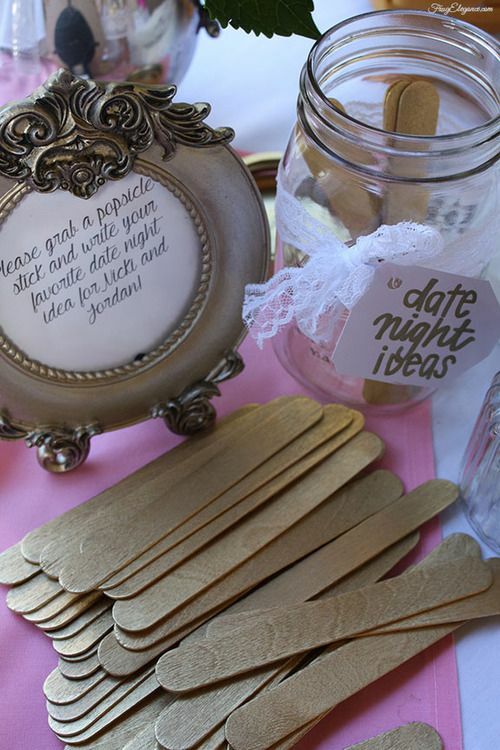 One way to get some awesome ideas is to ask your guess to write some on popsicle sticks. Then you can keep them in a jar and always refer back as a point of reference. 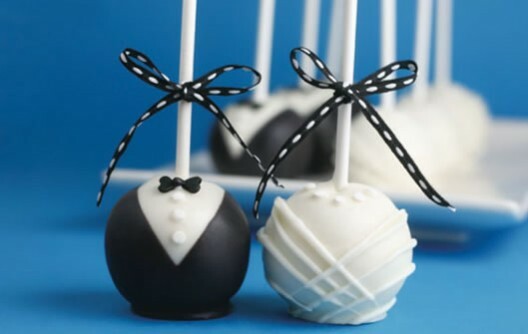 If some of the guests are watching their figure but would still like to get in on some of the desserts, offer them a cake pop or two. Have the “groom one” one flavor and the “bride one” another. “Spill the tea” is a phrase meaning “share the gossip”. 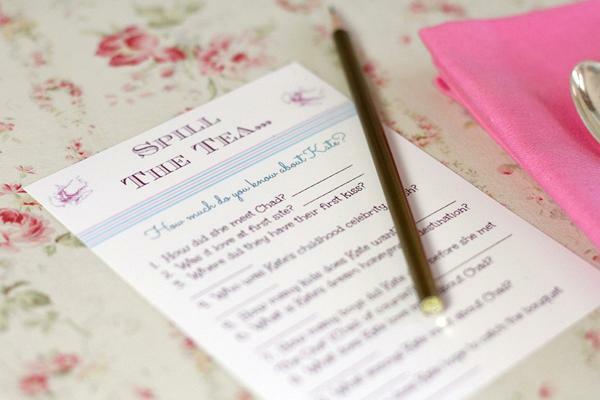 For a bridal shower, it would be questions related to how you and yours met, each other’s favorite things, etc. Mimosas are a wonderful drink to serve at bridal parties too, but everyone may not want to have orange juice and champagne. 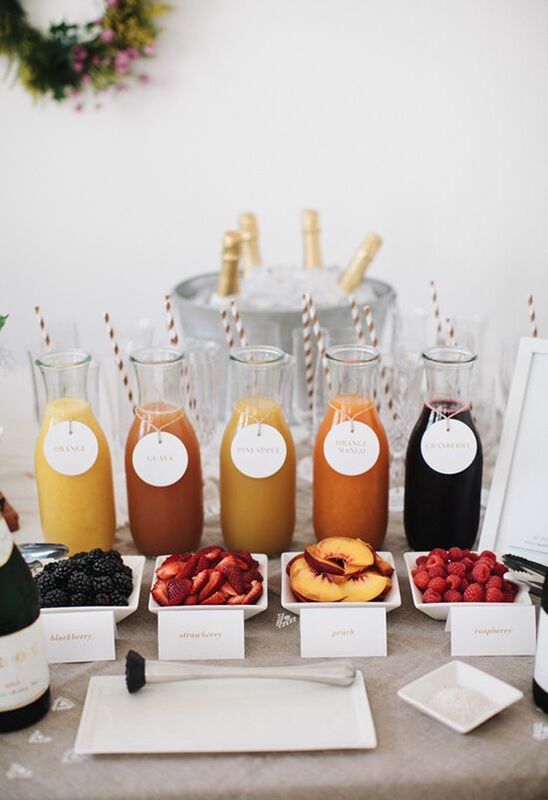 That’s OK. You can appeal to everyone’s taste buds by having a mimosa drink bar with an assortment of juices and fruits to choose from. Your guests will absolutely love it!